I submitted my application for the International Driving Permit (IDP) a little more than a week ago and finally received it today! Anyway, you can only use the IDP for a year and if you intend to drive longer than that, you’d have to apply for a conversion of your license to a Japanese one. According to Japan Guide, you can only apply for the IDP again if you leave Japan for more than 3 consecutive months. I’ve got no idea if our Singapore license can be converted directly or we’d have to take a theory and/or practical test but again, from the information I got sourcing online, Japan has agreements with over 20 countries including Australia, Austria, Belgium, Canada, France, Germany, Italy, the Netherlands, New Zealand, South Korea, Spain, Switzerland and the United Kingdom. I believe Taiwan is also amongst the list but I’ve got no idea if Singapore is one of those countries. I’ll update more information as and when I get them. 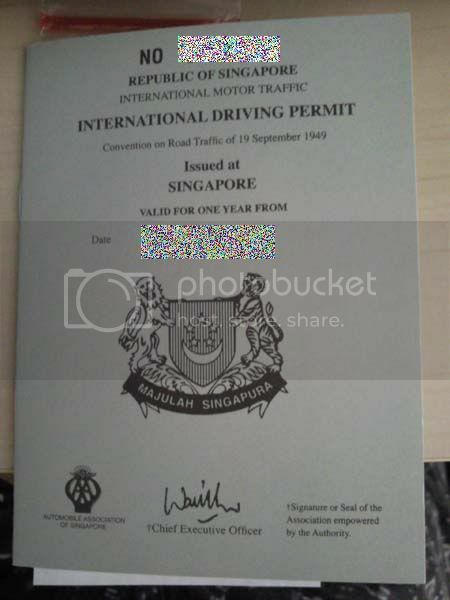 As for where to get an IDP, Singaporeans can visit the Automobile Association of Singapore to get one. The office is all the way in River Valley Road but the good news is, you can do it online too. Next step, get a car! very unfortunately, we have to take both a written and practical test. i hear it’s hard to pass (the practical at least) and very much a performance of you following procedures than actual driving skill. wow, thanks for the info. you have any intention to get a Japanese driver’s license?